Henry Ford was a smart man who understood the power of reasoning. He quoted, “If two people always agree, one of them is unnecessary.” One of the most important traits of being a good professional is ability to bring alternative perspectives on board. Some people call it “contrarian thinking” and others call it “differential thought” or “playing a devil’s advocate”. In any case, it is inherent to the advancement of ideas. Unfortunately, our education system (and in lot of cases, even our corporate system) does not allow people to think differently. A lot of our programming is done to comply with the rules and obey the orders. We almost have a fascination towards “What”, “How” and “When” – but we often miss the “Why” – the purpose. Conventional thinking, following the group and agreeing with them only leads to conventional ideas. Unconventional thinking, questioning for the purpose and taking a contrarian view helps to dig out the unconventional ideas. Leaders set direction for their teams and draw out strategies – when exploring alternatives, contrarian thinking helps them in assessing possibilities. Ability to think differently is one of the most important leadership skills in my view. Organization’s culture plays an important role in allowing people to think differently. If their ideas are consistently put down – they would either move on, or learn to comply – much like students in the school classroom who are not allowed to think unconventionally. It is important therefore, to build a culture that encourages differential thinking and embraces new ideas. Encourage scrutiny of how current processes work – and how they can be simplified for more effectiveness. Give ad-hoc assignments to team members and let them think. At least once in a fortnight, schedule a small group discussion on any topic. Let them express their views and then play a “devil’s advocate” to offer alternative perspectives. When someone offers ideas, encourage them. Nudge them to think deeper and wider. Show them the way by doing it yourself once. Encourage “calculated risk taking”, creative ideas and innovation. If you want to differentiate yourself as a professional, or as an organization – it starts from your thinking and ends with impeccable execution. While reading this blog, I remembered a scene of the movie ‘3 Idiots’. A student,in his final year project, tries to design a helicopter like device with a closed circuit camera on it. But the Principal,instead of encouraging his new idea, tells him that he is wasting his time. As Tanmay wrote our education system does not allow people to think differently. I agree to this and would like to add that instead of the bookish knowledge which students can cram and emit in the exams, education system should give more importance to practical exams and tests. I also remember my favorite teacher telling me that instead of accepting what is told to you, start reasoning. Ask why is it so? Try to find out and understand the real reason. Lastly, thanks Tanmay for such wonderful tips that a good leader should keep in mind to become the best. By going through all the tips on Leadership blogs which Tanmay has written, one can surely become the Best Leader. Amit – thanks for your continuing support to this blog. I really appreciate it. Thanks for reminding about the scene from 3- Idiots where a professor puts down the innovative suggestion from his student – a classic example of what actually happens in many schools (and in corporates – because same folks who pass from these schools populate the offices). The difficult thing about building such a culture is – to be conscious about it all the time and do it even when the demands of workplace press us to do otherwise. just like few mins ago you said, there should be “No-Fear” environment in every organization for the employee to be more “Creative”, I am really thinking how many companies actually promote such environment. Almost all the companies that says they follow open door policy, How many actually does? How easy is to create “no-fear” culture, and if they dont have it, why not?? what if one manager loves this culture and other has policy of chaos management? how to balance between both? It is easy to romanticize with the ideas of “people orientation”, “open door policy” etc. but the difficult part is to walk the talk and execute these. I am so glad that the post lead you to think further and explore the topic. Tanmay, Great Post! This is an buzzing issue. Education system need to be re looked in a fresh way keeping in mind the way the business/work environment is changing. In education we always focus on foundation and basics, but then innovative education gets missed out. The organisation culture should be such that it empowers and encourages employees to think differently. In fact employees are the right people to question and also provide ideas as they work closest on the customer’s needs and expectation or business. Thanks Kapil – I am so glad you liked the post. As Seth Godin says – they should only teach two things in schools 1) Solve Interesting Problems 2) Lead. The problem is that our education system moves too slowly, and by the time it evolves, the market demands change. It directly impacts the workplace/organization culture because same people populate the workplaces. Leaders can solve this problem by filling the gap and adopting the strategies mentioned in the post to nurture innovative thinking and idea exploration. I agree that employees (I prefer calling them “team members”) are best candidates to think better for customer – since they are the nearest. Thanks Tanmay. I agree that education system or institutions move slowly. I remember that the computers or courses were inducted in the schools in way back in 90’s in partnership with private instituions as optional subject. Today its part of the regular subject stream in schools. Great post Tanmay! Unconventional thinking should be the order of the day. An unconventional approach may transform a company just like it did HCL Technologies. Vineet Nayar has talked about it in his book ‘Employees First, Customers Second’. His approach of putting employees first involves bringing about change, delivering value and differentiating HCL Technologies from its competitors. This resulted in the creation of employees that were engaged and management that was accountable. Thus, when employees are put first, the customers ultimately benefit from it. Thanks Kavita for chipping in and expressing yourself. Leaders have to realize that we live in a knowledge intensive world where people make all the difference between your success and failure – managing them like factory workers can be detrimental. HCL is a great example of how “People First” approach works in transforming the organization and deliver great results to customers. As you rightly summarized – customers win when the people working in a company win. Critical thinking is another term that might be useful. The a problem of ‘contrarian’ thinking if taken to the extreme is it can become a hindrance – ultimately you need a shared sense of belief to initiate anything in a group environment. People with large egos will naturally practice being contrary because someone else’s good or unconventional idea challenges their self-worth. I’ve worked in many firms where egos bounce back and forth and a lot of ideas get discussed but not a lot is agreed upon or even done. But as you say, in such cases it’s important to have decisive management. A more eastern approach to leadership might be useful here. David – I agree with your suggestion of also calling it “critical thinking”. When a leader’s intent is to bring out alternative perspectives from the team – contrarian thinking can be provocative and hence the need to be firm and polite while doing so (as also mentioned in the post). It has to be done smartly – else contrarian thinking can take extremes and become a hindrance. When playing a “devils advocate” – the leader plays a role of facilitator who uses this technique to bring out ideas from people (intent). In a group dynamics setting where people discuss alternatives to arrive at a conclusion – contrarian thinking should always be done with a constructive undertone and should lead to critical thinking – else as you very rightly said, egos clash and people don’t arrive at a conclusion. Loved that quote from Lao Tzu – thanks for sharing! Thanks for you response Tanmay! Looking forward to more such posts from you. Thanks Kavita. When you (as a reader) take the time out to comment, it is an obligation to respond and take the conversation forward. 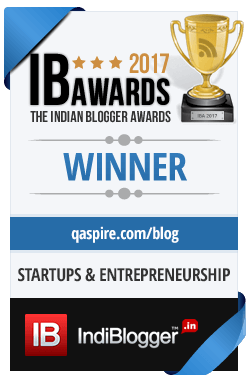 Thanks also for your continued support to QAspire Blog. @Gurprriet Siingh: “Aim for safe-fail not fail-safe” – Amen to that. This thought, I think, is at the core of how leaders facilitate innovation.